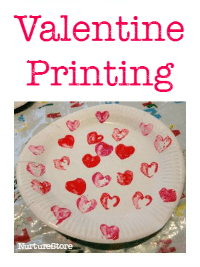 February 14th is nearly here so we’re starting on our Valentine crafts with this carrot printing picture. It’s a simple craft for young children to try out, so long as they’re old enough to understand that this carrot isn’t to go in their mouth. 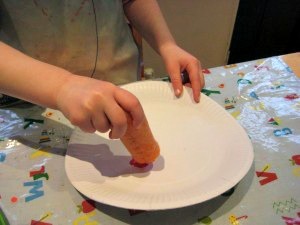 You may have tried potato printing before but I find carrots are easier for little hands to grip. 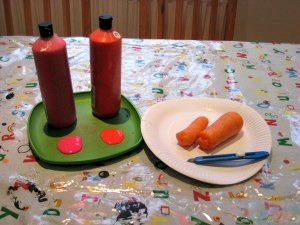 You will need: a paper plate, some red and pink paint, a plate to put the paint on, a carrot, a craft knife or a kitchen knife with a sharp point, a ribbon and some sticky tape. 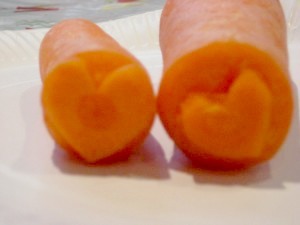 Cut the carrot in half and etch out a heart shape. 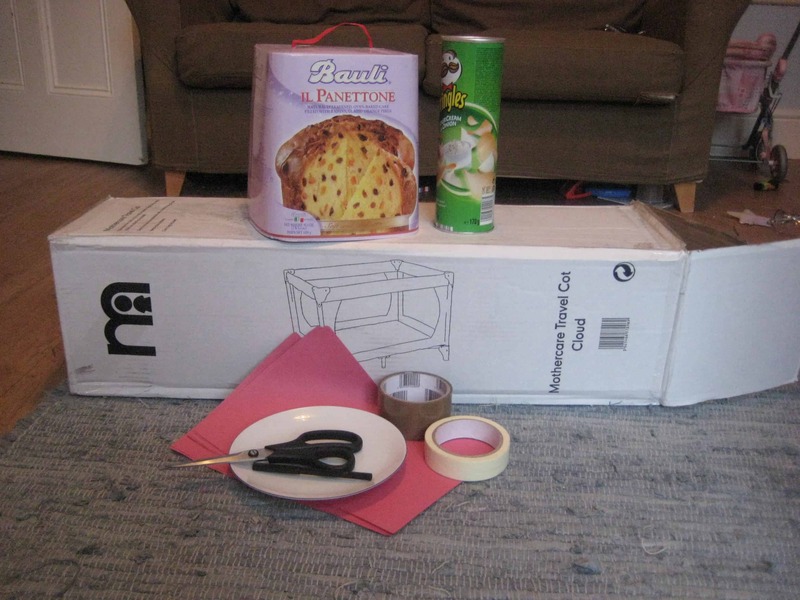 A grown-up needs to do this part of course, but it’s fairly easy – I managed it! 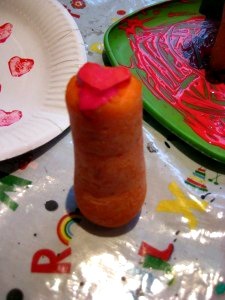 We did a small heart on one piece of carrot and a big heart on the other but you could do a cross shape for a kiss too. If you level off the other end of the carrot you’ll be able to stand it upright when you’re not using it. 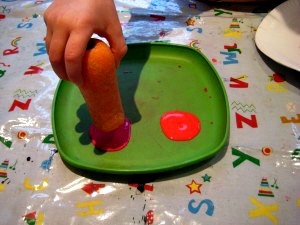 Put some paint on your plate and dip your carrots in. 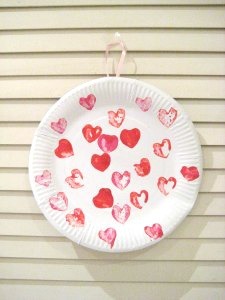 Print out your hearts on to the paper plate. 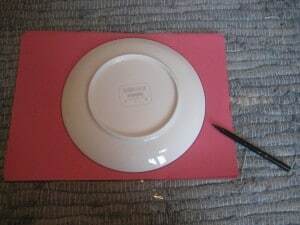 Keep going using the red and pink paints until your artwork is complete. 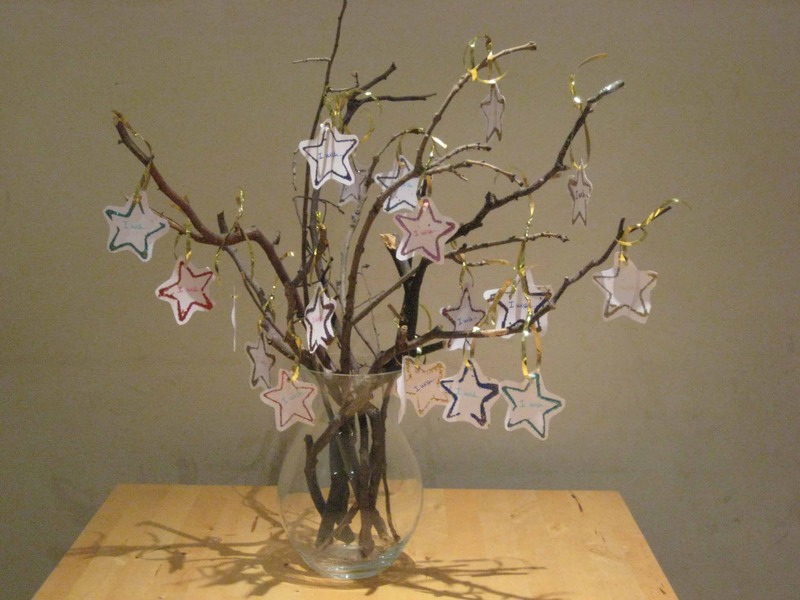 Add a ribbon on to the back using sticky tape and hang your decoration for all to admire – or give as a present to the one you love. We’ve just finished ordering seeds for the garden ready for the Spring (roll on!) and so have a few seed catalogues lying around. 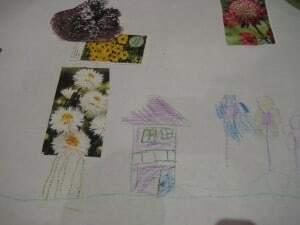 Rather than put them straight in the recycling bin we were inspired to make a garden landscape picture. We used a long roll of white paper, but the back of an old roll of wall paper would be a good alternative. With four artists at work we set up 4 stations along the roll with crayons and glue sticks. 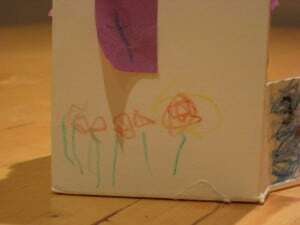 The older children went through the catalogues and cut out lots of the flower illustrations and then everyone set to work. 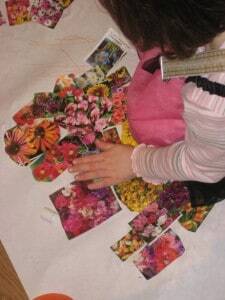 The younger children enjoyed using the glue to stick on a bright collage of flowers. The older ones concentrated on adding their own illustrations, with lots of talk about hanging baskets and mini beasts. Like this idea? 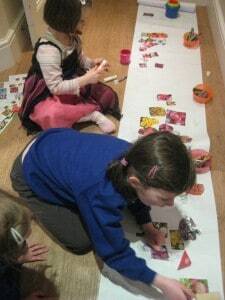 How about using a roll of paper to make a street map or a life sized picture of your child? When you’re nurturing children I think you should always start with them – what they’re interested in and want to explore. 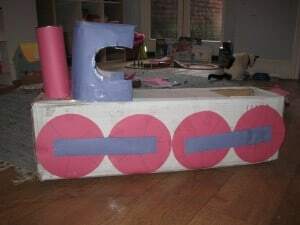 At the moment my youngest is really enjoying playing trains, so I’ve been using this as a way to incorporate some ideas about shapes and colours. Yesterday we made a ride-on train from a cardboard box, which has given us lots of role playing fun. 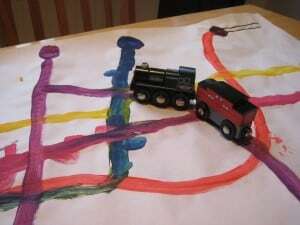 We’ve been talking about what happens at a train station, where you might go on a train and how trains work. This lead us on to talking about trains going underground, so we looked up a picture of the London Underground map. And wow! She was captured by all the lines and colours, and wanted to know the names of all the stations. 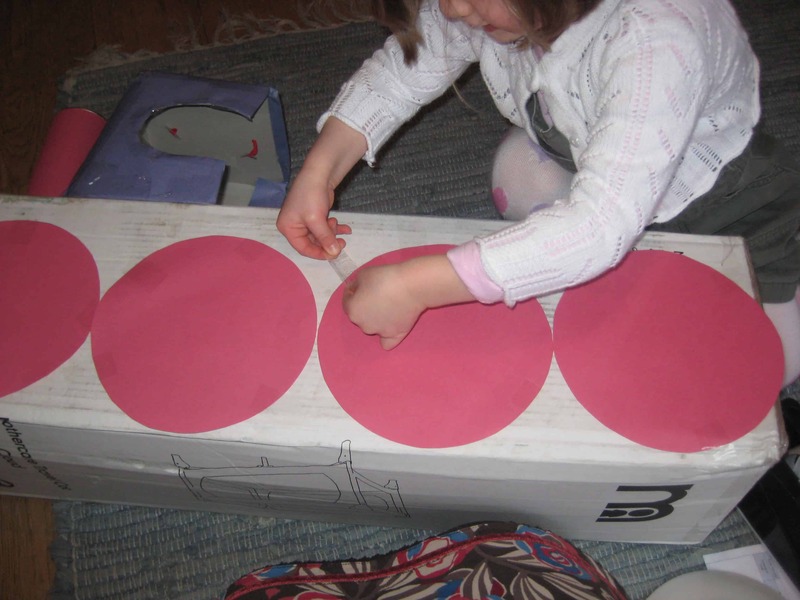 She was tracing her finger along the different lines (which is great hand-eye co-ordination practice) and I thought she might like her own map which she could drive her wooden trains along. This turned out to be a great idea as she really enjoyed making her version of the map. 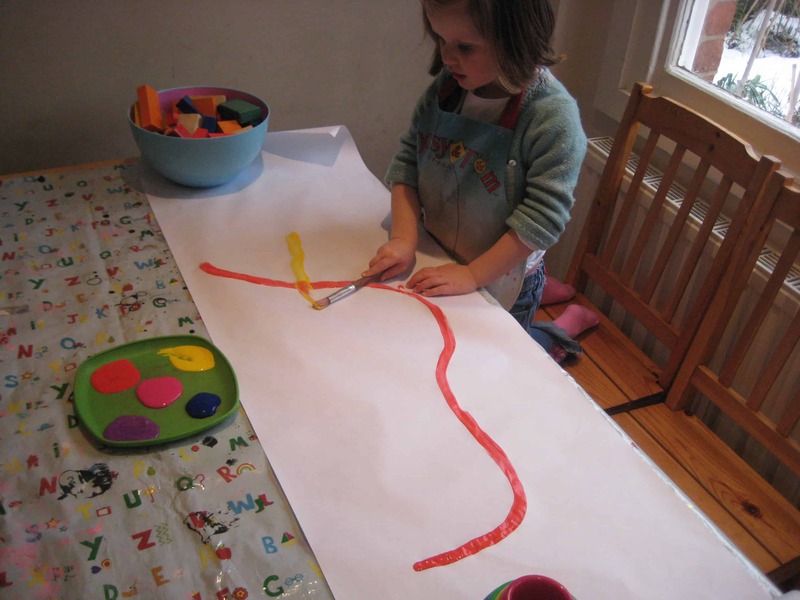 We used a long roll of paper and it was great for her to have the space to really extend her painting. And she knew the names of all the colours too. 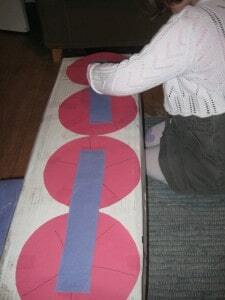 Once it was dried we brought over her train set to bring her map to life. 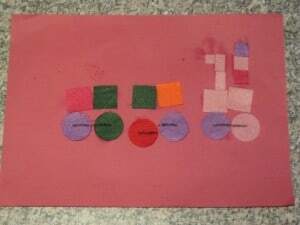 Another way we explored the theme of trains was to make pictures using felt shapes. This gave us the opportunity to name the different shapes, count their sides and trace our fingers around their outlines. We looked at our wooden train to see what shapes it was made up of and then used the felt shapes to re-create the train in our picture – comparing the 3D object with our two dimensional picutre. I’ve got a couple more train-inspired play ideas coming in the next post too. One helps with pre-reading skills and another is good for maths. Hope you’ll come back and see them. Got a long cardboard box? 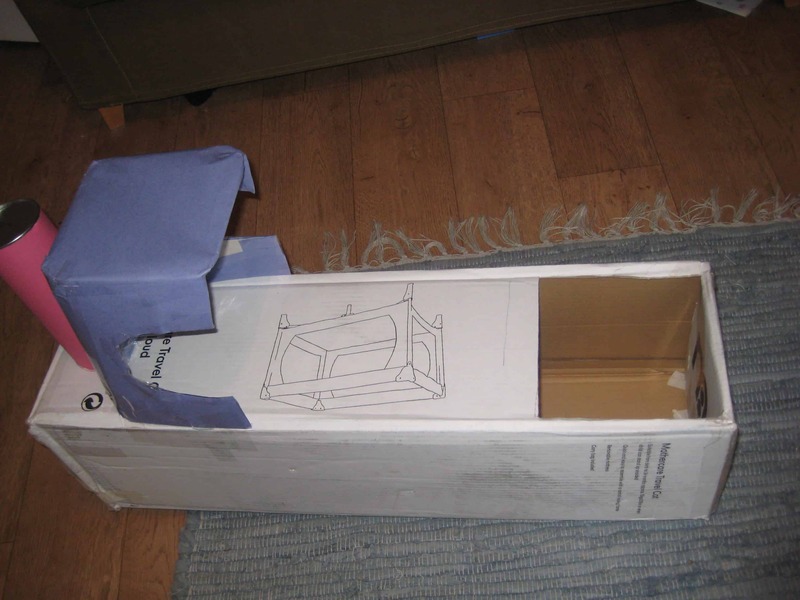 Here’s how to transform it into a train, for lots of role playing fun. Wrap the tube in coloured paper. We used sticky tape throughout for all out sticking. 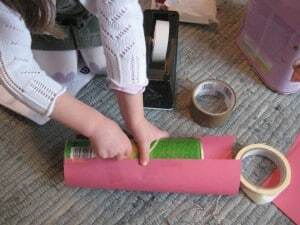 You could use glue and could also paint the train instead, but then you’re going to have to wait for it to dry – and 3 year olds need instant gratification! Place the tube where you want your chimney to be and draw round the bottom with your felt pen. 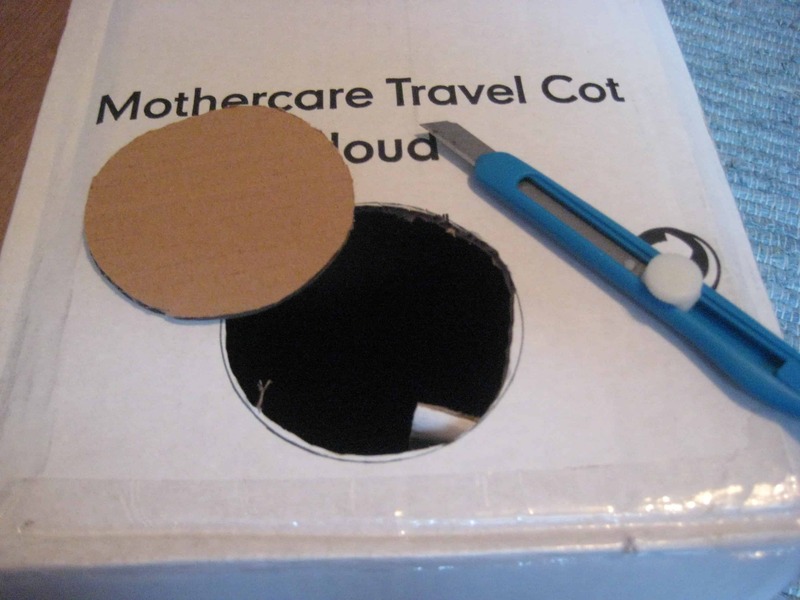 Then cut the circle out with a craft knife (grown-ups only, of course). Poke the tube through the hole and you have your chimney. Now draw round a small late and cut out some circles from coloured paper. Stick these along the sodes of the train to make the wheels. Count tham as you go along and talk about what shape they are. 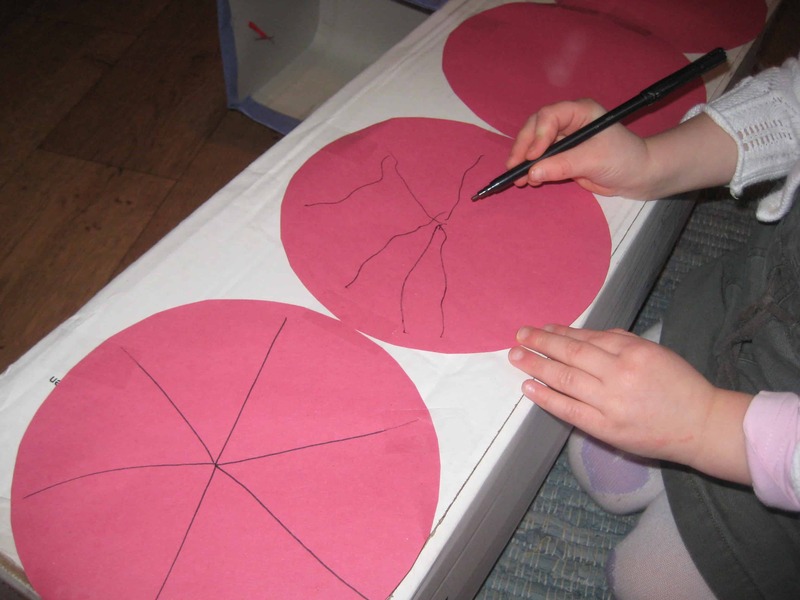 Adding spokes onto the wheels is a good opportunity to practice pencil skills. 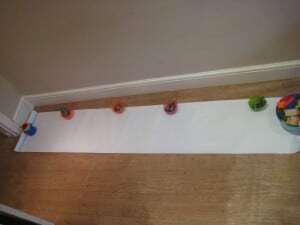 Link up the wheels with a different coloured strip of paper . Talk about how this rectangle shape is different to the wheels. All aboard! Ready to roll! Choo choo! 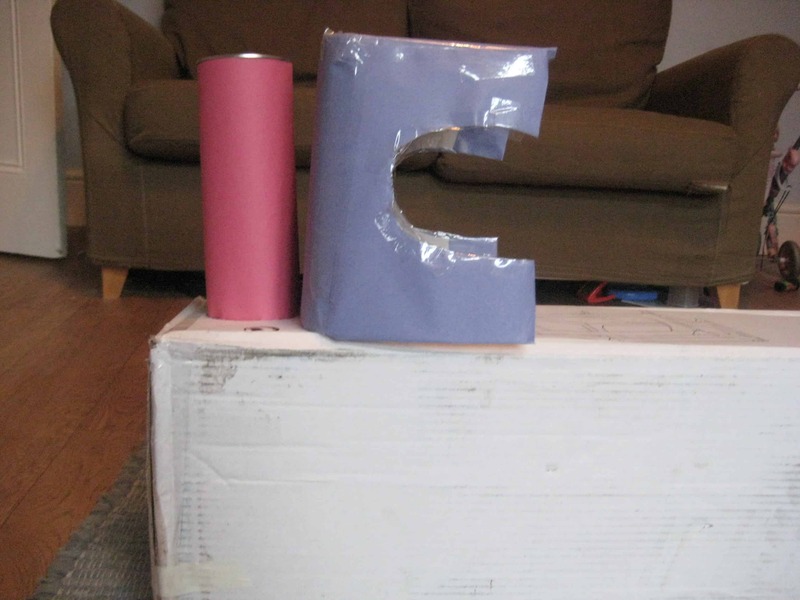 Add some props to extend the play possibilities – a drivers hat, some passengers, some parcels to deliver. You can introduce some letters and numbers into the play by making signs for the stations you visit. How about making a train timetable and some tickets too? 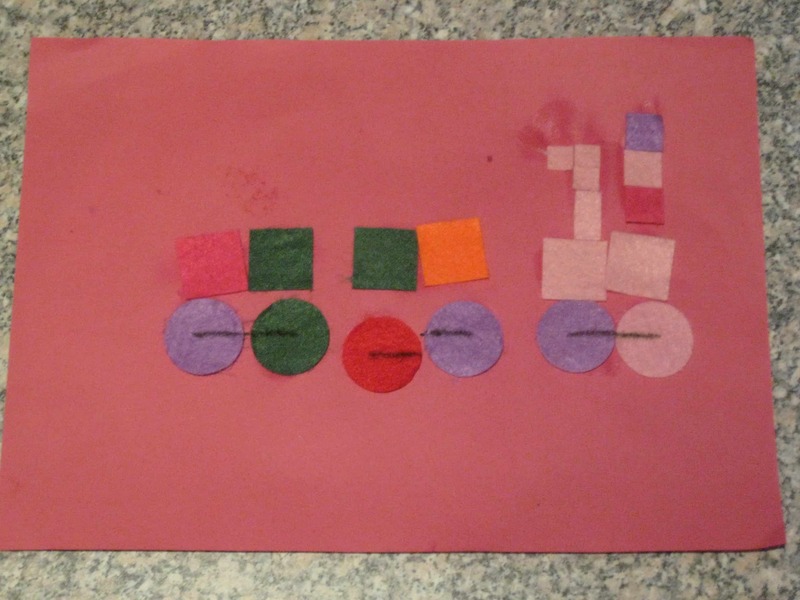 We’ve been doing some train inspired art and maths play too – come back and see the next post to have a look. Happily shared with Today’s Creative Blog. 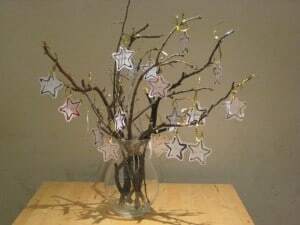 I have the absolute pleasure of being a guest poster over at notimeforflashcards with my ‘Make a Wish Tree‘ craft. 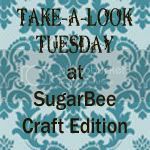 Please pop over to have a look. If you don’t know notimeforflashcards already you’re in for a treat as it’s packed full of great ideas to nurture your child. 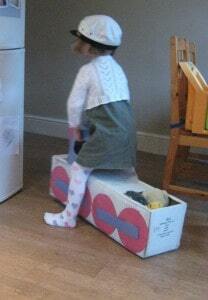 My 3 year old has been asking lots of questions about houses recently: what’s under the floor? which room is on top of this one? how many families live in a block of flats? 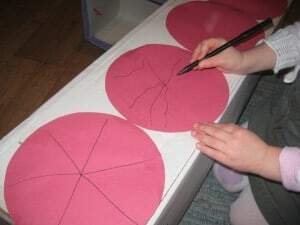 I’m also keen to encourage her to pick up a pencil and do some mark making and drawing, as this isn’t an activity she tends to choose for herself but obviously is a skill she needs to develop. 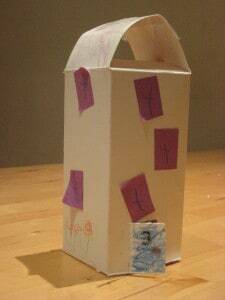 I always like to take the individual child as a starting point for any activity I’m planning – what are they interested in and what skills are they currently developing?- so with all this in mind we decided to make some model houses. 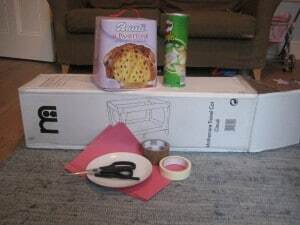 We used some cardboard boxes which we opened up flat. This gave us a clear side to draw on and it was much easier using a flat surface rather than a 3D one. We cut out a door to start with and coloured it and the roof in with wax crayons. We talked about what shapes windows are and had a look at the ones in our house. I helped my daughter cut out some rectangles from some paper and she used a glue stick to stick them on by herself. She used a crayon to put crosses on each of the windows to make them look like the ones we have at home. I was really pleased to see she carefully held the crayon in a palmar grip and placed the crosses right in the centre of each window – she’s improving her pencil control. 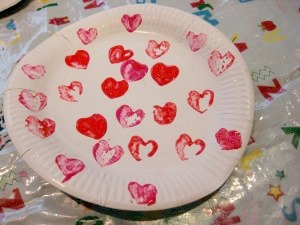 She also added some beautiful flowers, which gave the opportunity to try making vertical and circular marks. Every front door needs a house number so she checked our number line and decided on a ‘3’. 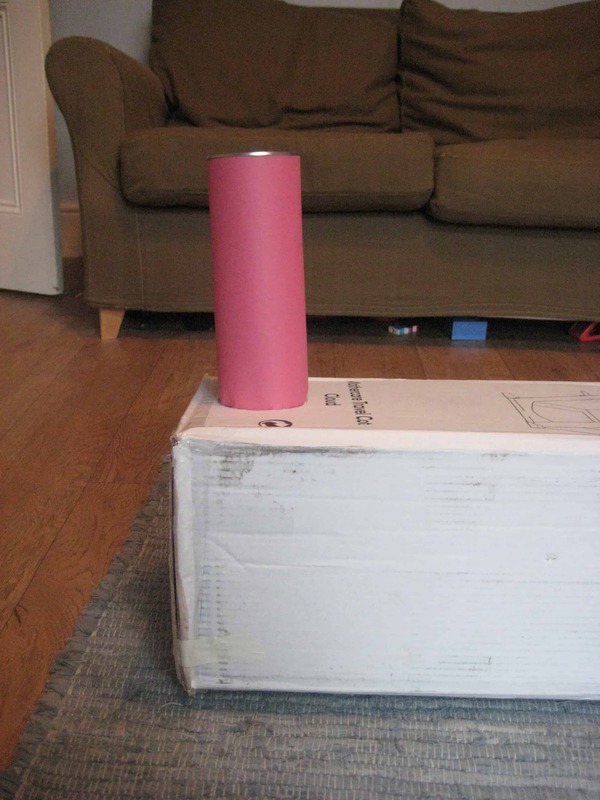 We then folded it all back up again and fastened it with stickytape – very simple but I think it looks great and she’s really pleased with it. 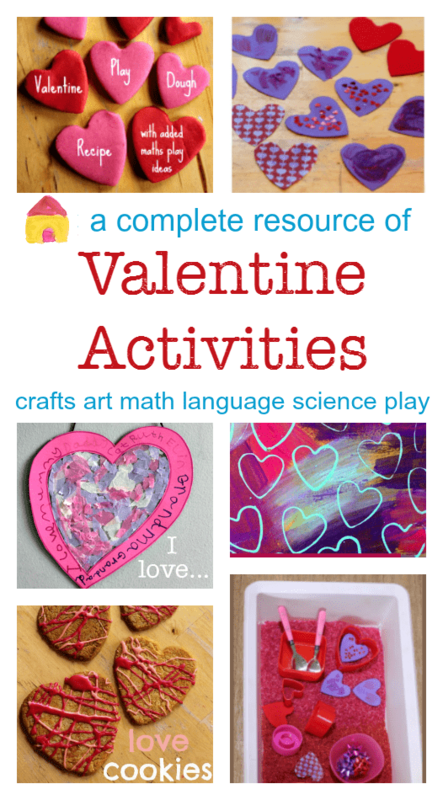 So that’s fine motor skills, mark making, decision making, numeracy, three dimensional modeling, shapes, colours, art, collage, and some ‘Mummy and me’ time – all from her current interest in houses. Amazing how many skills you can nurture in one simple activity. 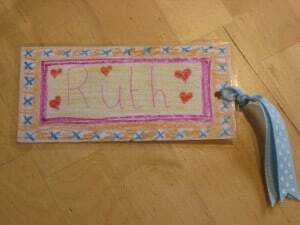 We’re giving some books as birthday presents to friends in my daughter’s class so we decided to personalise the gifts by making a bookmark for each child. 1. Cut out a rectangle of card and use pens and pencils to draw a design. We wrote the birthday child’s name one one side and ‘love from …’ on the back. 2. 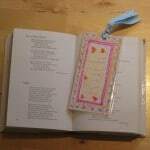 Laminate or cover in sticky backed plastic. 3. Punch out a hole and thread a ribbon through. A nice gift for grandparents’ birthdays and for Christmas too.